The selection of designer dinnerware is amazing to me. There are so many styles. Whether you are looking for something ritzy, simply elegant, cute and practical, or a casual dinnerware set current and legendary designers will never you let you down. I've got my own ideas which I will share, but I'm very interested in your favorite designer when it comes to dinnerware, tableware and decorating. Please tell us your stories, share pictures and tell us about your favorite designers! Who Is Your Favorite Dinnerware Designer? -Do you have a story about it? -Got some pictures to share? Speaking of legendary, I can't help but think of Gianni Versace. He was an Italian fashion designer that created designer dinnerware commonly known as Versace Dinnerware. His designs are very unique. I'm particularly fond of the Vanity dinnerware pattern. Martha Stewart Dinnerware definitely fits into the picture of designer tableware. 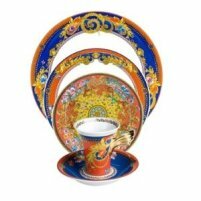 Her designs are quite extraordinary and are available in several ranges from melamine dinnerware to fine china. Chris Madden Dinnerware is beautiful and very fashionable. She hasn't introduced too many patterns, but the Chris Madden patterns are simply gorgeous. Tracy Porter Dinnerware is practical, but beautiful. Her design methods are different than most. She often mixes and matches in dinnerware sets and decorating to create inspiring ambiance. Many of her dinnerware designs are hand-painted. Her artistic abilities definitely shine in her dinnerware patterns. From casual to formal, Calvin Klein Dinnerware marks its spot in the tableware industry. Some of the patterns put out by Calvin Klein are simplistic while some are quite exquisite. This brand is definitely worth looking at if you love designer dinnerware. Colin Cowie designs are also amazing. He is known as a wedding and event planner. Colin often uses Glass Dinnerware to make his events special. For special occasions, his thoughts and designs are sure to be helpful. These are just a few designers that caught my eye when looking for ideas about dinnerware by designers. I am certain that there are many more that are mentionable. If you have a favorite designer that creates dinnerware, please share with us! Our readers will certainly appreciate it. We love to hear special stories too.